My feeble modelling attempts to add a parallel 17 meters dipole onto the TH1vn tri-band dipole were not as conclusive as I'd have liked. As I said in that article, one problem is the difficulty of modelling traps, especially those in this Hy-Gain element since they are physically long and I do not know the design parameters. I instead opted to model the element as an inductor-loaded tubing element that would resonate at 14.1 MHz at the measured length of the element. I did not expect to get the model right but to hopefully get it close enough to identify the key sensitivity parameters, if any, to simply tuning and adjusting. I chose to jump into the actual construction and just see what would happen. You can see the original antenna feed system I came up with in my first article on adapting the TH6DXX driven element into a simple tri-band dipole. Since the antenna is similar to Hy-Gain's TH1 commercial product I chose to call it the TH1vn. The physical design and construction started before the modelling work so I was able to get the modified antenna back in the air only one day after my previous article on modelling the design. Before I come to how that went I will take the opportunity in this article to show how I went about building the antenna. The first thing I needed was a set of spacers (or hangers) to suspend the parallel 17 meters element from the TH1vn. I needed something fast, cheap and reasonably reliable. This is an experiment which does not, at this time, require the effort to make it last for years. With the ample quantity of PVC pipe left over from construction of the spreaders for the multi-band inverted vee antenna I made the spacers in the same fashion. As can be seen in the picture there are 8 spacers, 4 for each half of the antenna. 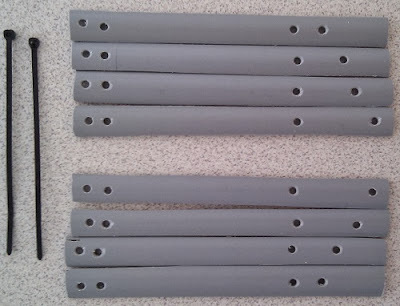 Ultraviolet-resistant cable ties thread through the drilled holes to bind the spacers to the TH1vn and 17 meters element. The holes for the TH1vn (on the right) are placed to accommodate the tubing diameters at various points along the antenna. Later I enlarged the holes for the 6 inner spacers to fit longer and wider cable ties. Notice that the holes for the bottom of the TH1vn are aligned so that the elements are parallel along their lengths. Perfection isn't required for this operation so don't look for precision cutting and drilling! I then made an error in the material choice for the 17 meters element. Solid copper 12 AWG wire may seem rigid but it isn't. This is amply demonstrated in my first attempt to hang a 4 meters long half-element from the TH1vn. This is obviously not going to work. Wire in this application can only work if it can be placed under tension. In this application that is difficult to achieve. Note how the element extends beyond the tip of the antenna. Not having a suitable alternative in my junk box I made a trip to a commercial metals supplier and purchased two 12' lengths of ¼-inch diameter 6061-T6 solid aluminum alloy rod. These are cheap, lightweight and don't dangle too far out the passenger window of my car. As you can see this worked out far better. However it is not perfect. When the assembled antenna touches an object during the lifting process -- which happens a lot -- the spacers are easily pushed out of position. Fortunately the antenna is very light, which allowed me to move the antenna hand-over-hand at the top of the tower and manually reposition the rods and spacers. As I said, the mechanical design is not perfect. With a cobbled together feed system -- alligator clip leads, bits of plastic, wire ties, etc. -- I managed to load it up before dark. There is now only a brief window in late afternoon before sunset arrives. It works, after a fashion. With the same wire lengths connecting the coax to the tri-band element the same as before the SWR minimums moved on each of 20, 15 and 10. What it didn't do is shift in the way I expected. In the typical fan dipole the antenna for the lowest frequency is relatively unaffected by additional of dipoles for the other bands. That is not what happened. The SWR shifted from the lower end of 20 meters to 13.7 MHz. This is not acceptable, and its under-performance shows. The shift on 15 meters was more modest, having been lowered by about 100 kHz to 21.0 MHz. On 10 meters it shifted upward to 28.6 MHz. The section inside of the first trap, including the wire to the coax, affects all 3 bands. The section between the traps primarily affects 15 and 20 meters. The section beyond the last trap primarily affects 20 meters. It is that last bit that will need the most adjustment to shift resonance back toward 14.1 MHz. There is rain forecast for the next few days, which will reduce the time when I can complete this task. Once it's done I'll write a follow-up article on the details of the feed system and how the antenna performs. In this case the performance is all about bandwidth and SWR (impedance) since none of this work changes the far-field pattern. It's still just a multi-band dipole on a short tower.